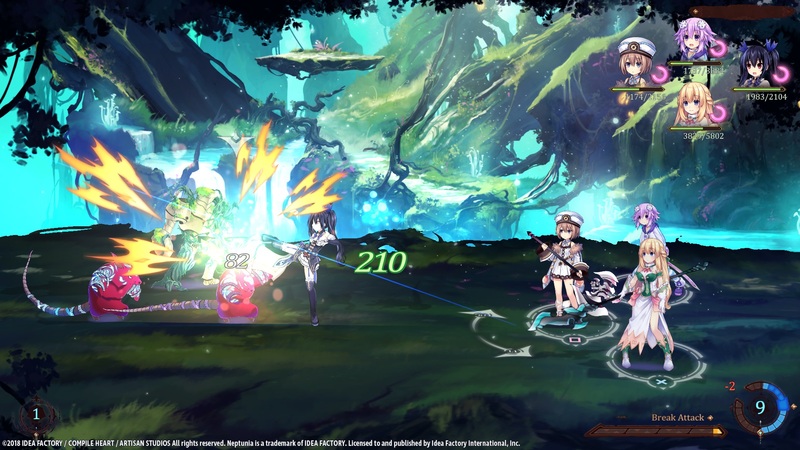 Super Neptunia RPG is a game that many Neptunia fans have had their eyes on since its announcement as Brave Neptunia. Not only is it a 2D Neptunia title, but it’s also the first Neptunia title to be handled by a Western developer. In this case, Artisan Studios from Canada. While some fans tend to worry when a Western developer tries their hand at a Japanese franchise, I tend to be quite excited. After all, a different perspective can bring fresh ideas. I’ll point out that Nintendo has had great success with Western developers utilizing their IPs. Just look at Metroid Prime and the Wii version of Punch-Out!! 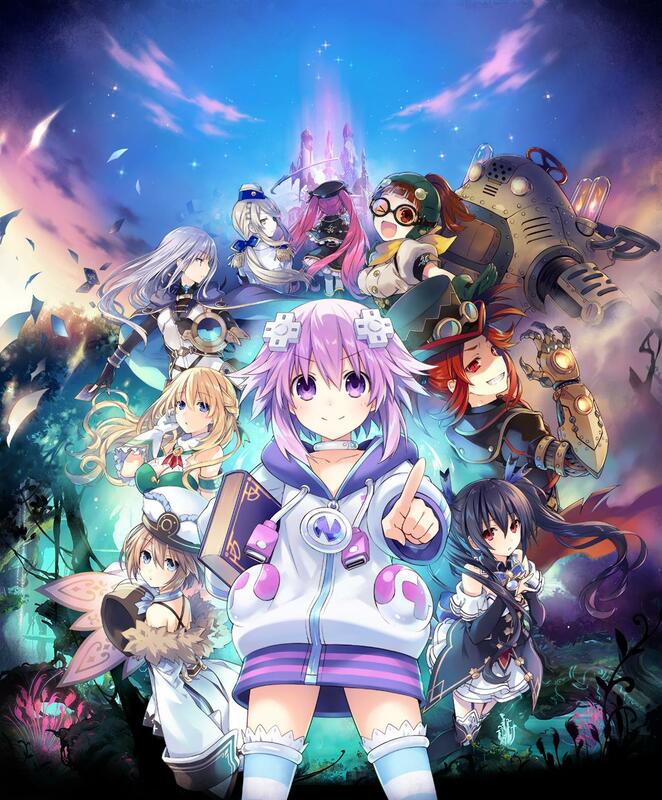 So, when I found out that Super Neptunia RPG would be at E3, it was instantly on my list of things to play. And play it I did, twice actually to try and get a feel for the game and gain some understanding. Because this demo left me with more questions than answers. Per usual, the artwork for the franchise is gorgeous. My initial impressions of Super Neptunia RPG were not great. While the game does work, it felt very rough. 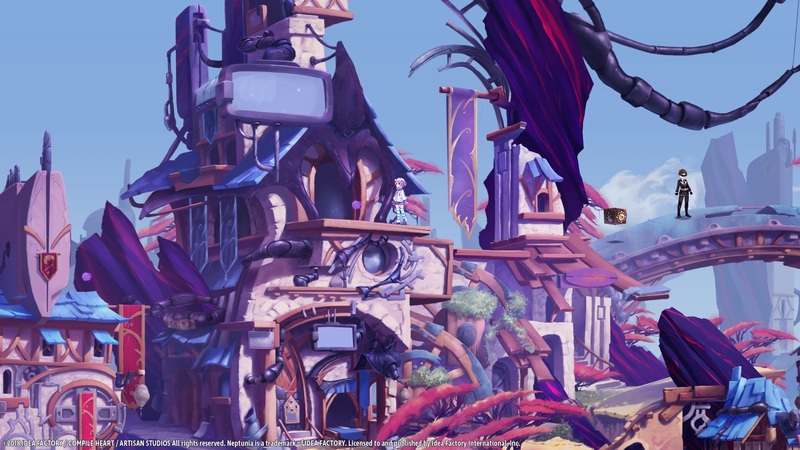 The town didn’t seem to have a lot of life in it, the battle system felt conceptual, and outside of her victory pose, Neptune was not smiling. I know that sounds like an odd detail but think about it. When does Neptune not have a smile or grin on her face? She’s a very expressive character, so a lack of expression is a bit jarring. For a game that’s going to be out in Japan in about three months, this was rather worrying. However, I may have an answer for all this. I suspect this was an early build of the game and not something recent. For those who aren’t as familiar with game development, the type of build your playing indicates the point of development the game is in. A Beta build is far along in development while Pre-Alpha is very early on. 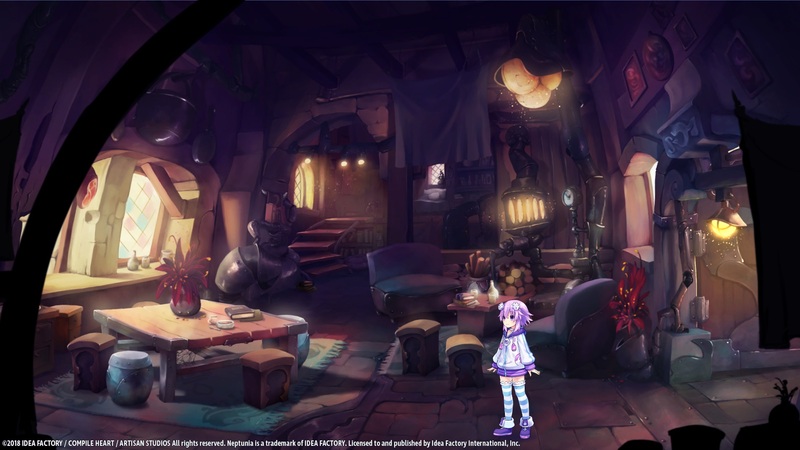 The build of Super Neptunia RPG that I played feels like a very early build. Most likely Pre-alpha to Alpha. And if that’s true, everything makes sense. For lack of a better term, this would be a proof-of-concept build. All the mechanics are there and work, but it’s not polished. That does raise a question though. Why wasn’t there a more recent build available? The town (Lastation in the demo) looks amazingly detailed and you can tell a lot of love went into the designs here. I can only speculate, but I think it’s safe to say that this build was the most stable. I’m certain that IFI has a much more complete build back at their offices, but if it’s crashing or not optimized then it doesn’t make sense to bring to a trade show. E3 is a place to show off working demos of games. It’s better to bring an older, more stable build than a recent one that’s prone to crashing. After all, nothing is more frustrating than a buggy game. With this in mind, I’m going to give two opinions about Super Neptunia RPG in this impressions piece. But first, let’s talk about the game a bit. 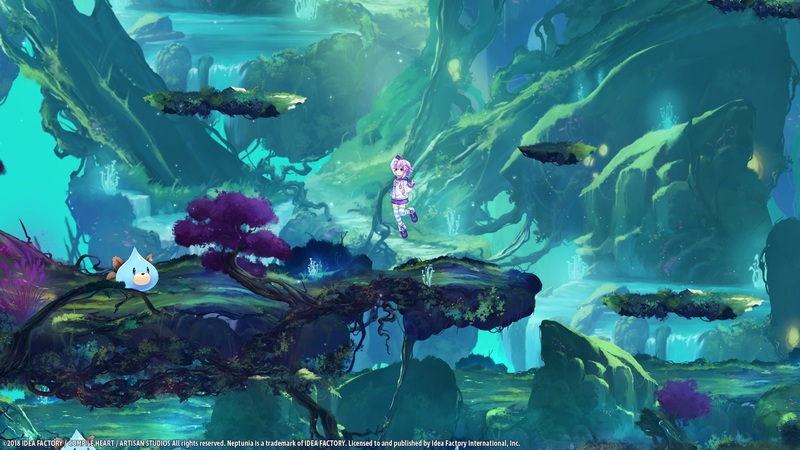 Super Neptunia RPG is 2D platforming RPG. If you’ve played Paper Mario or Super Mario RPG then you have an idea as to what I mean. You’ll need to use your platforming skills to navigate through some of the areas. Thankfully to help you, you’ll have access to something that would only exist in a Neptunia title: the Pudding Dogoo. Yes, a Dogoo made of pudding. And it somehow increases your jump height. Pudding Dogoo aside, jumping in Super Neptunia RPG feels good and even in this build feels precise. Also, take note of that gorgeous background. Actually, let’s talk about that for a second since it’s a good example of showing what I mean by the game being “rough”. On one hand, the Dogoo looks great and upon whacking it with Neptune’s sword it’ll make a rather amusing face. However, using it to jump higher is a bit… odd. You would think that being made of pudding and being a Dogoo, you’d bounce off it. Especially when you consider that it augments your jump height by quite a bit. Instead, you use it as a platform. You jump on it once, stand there, then jump again. I can kind of see this working, but bouncing off of it just makes more logical sense. As I said, it works, but it feels incomplete. The same can be said of combat. 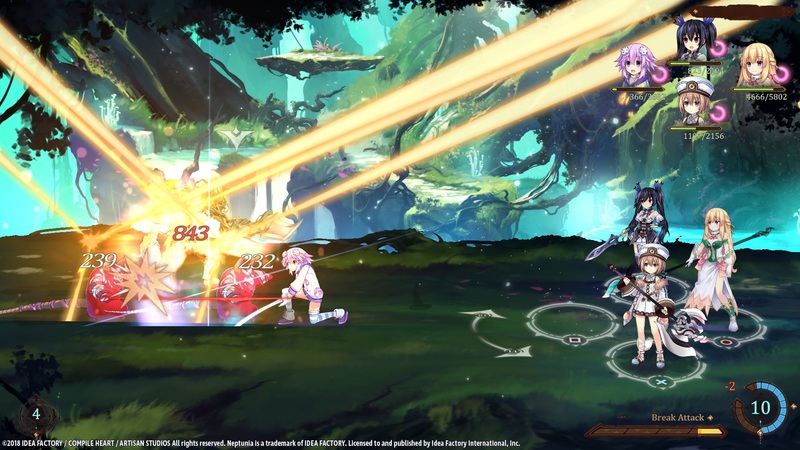 A battle in Super Neptunia RPG. Note the circle in the lower right-hand corner. That show’s how many action points you have; ten in this case. Combat has a lot of potential. Your party consists of four characters (in the demo’s case, the main four goddesses) and each character is assigned to a face button on the controller. When pressed your character will perform one action which is dependent on your formation. The party formation is determined by who the “leader” is at the moment. So, if Nep is in the front it’ll be an attacking formation, conversely, if Blanc is in charge it’ll be a healing formation. As such, you’ll need to use the right formation for the right job. However, each action also has a cost. In the lower right-hand corner of the screen is a circle that will slowly fill up. Each section of the circle that fills up counts as an action point. Each action you take in battle has a cost associated with it. So, a careful balance between stocking these points, switching formation, and attacking/healing is needed. Really, I can see this being a lot of fun, especially since it gives you a lot of freedom and keeps you engaged. However, there the early nature of the build was again an issue. While as a still image this looks amazing, in motion it’s a bit hard to see what’s going on. For one, the animations seemed a bit jarring at times. Occasionally the game would stutter, while some animations either weren’t implemented or were too quick for my eye. Vert’s magic attacks are a good example of this. While she certainly is canonically quick, I didn’t notice an animation associated with her magic attacks. They just kind of happened. I’m sure this will be smoothed out by the final retail release, but I think you can see what I mean. So where does this leave my impressions then? As I mentioned I’m of two minds here. As a conceptual demo, it’s perfectly fine. I can see a lot of potential and many of these issues are easily fixed. It’s just that this build doesn’t have those solutions yet. This is the build that’s basically made to make sure things work and then you polish it up later. However, as an E3 demo, it’s not great. This build of Super Neptunia RPG is kinda like this image. It looks beautiful and there’s lots of promise. However, it’s also very sparse and lacks the quirkiness of the franchise. While you have 15 min to play with the game, I found myself losing interest rather quickly due to the lack of things to do. However, I’m willing to give the developers and IFI the benefit of the doubt here. I really do think this was just the most stable build they could get before E3. That said, how good of a game this will be in the end is up for debate. It’s certainly not the worst Neptunia game by any means. Gameplay-wise, I still contend that the original Hyperdimension Neptunia is the worst in the franchise. Though, my least favorite games happen to be Action U and Producing Perfection. Conversely, it’s too early to tell if it’ll be the best game. Especially since I find the original Megadimension VII the best game in the franchise mechanics-wise; with Mk2 being my personal favorite for its story. In the end, I think Super Neptunia RPG is shaping up to be a competent game, though I’m hoping we’ll see an updated build of the game before it launches later this year. Super Neptunia RPG will be launching later this fall on the PlayStation 4 and Nintendo Switch.